A while back I started trying various turntable mats to explore the potential for improving on what I had been using. Up to that time I had simply used whatever mat came with the turntable. I was simply considering this to be a lower priority than my other audiophile explorations. Over the years I have owned many turntables, mostly Lenco idler drive units. These all came with various shapes and thicknesses of rubber mats. My TT mat experiments included DIY felt, cork and soft foam, and various shapes and thicknesses of rubber Lenco mats. I quickly discovered that some turntable mats are like the tone knobs that were common place on pre-80's stereo amps and receivers. Some affect the bass, some affect the treble, some the mid-range. Others produced slightly mushy bass, some a loss of air; the music sounding a bit flat or less alive. I was discussing this by email with an audiophile friend who told me that he had been using an acrylic mat for some time and considered it to be the best results that he had ever experienced. So I set out to try this material. My first attempt was quite simple, I just replaced the rubber mat I was using with my acrylic cartridge alignment/strobe disk. (see the first photo) I was quite pleased with the results, I felt that this material was doing the least harm to the music. Based on these results I set out to design and build (actually I had it done in a machine shop) an acrylic mat. Why do I need a mat? Why not remove it completely? 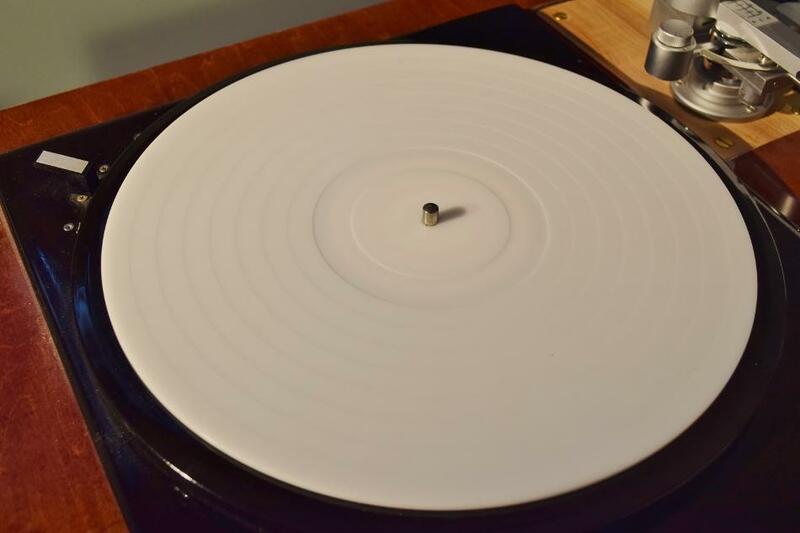 The platter is typically larger in diameter than the record; because of the round bead on the perimeter of most records the record would touch the platter only at the outer perimeter. Using a weight or clamp can help but not fix this problem. Many platters are made of metal and are very good at transmitting vibrations. Not something that is on our wish list. 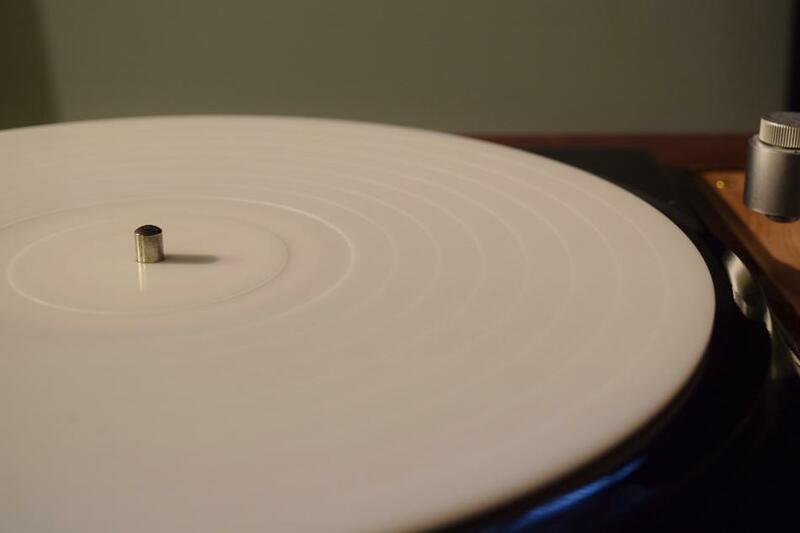 If the platter is completely flat, which is often the case, then the record will not sit correctly everywhere. A record is not flat due to the thickness of the paper label. The platter typically has a very slippery surface. The basic mat profile objective was to ensure, as much as possible, that the grooved area of the record was in good contact with the mat at as many points as possible. Also, I knew from the start that I was going to use a record clamp or weight at all times. I feel that this is essential in order to eliminate the potential for slippage and to help with any slight record warp. The photos below show the final design as built. The thickness at the outside diameter is 2.75 mm. The thickness tapers down in 8 steps for a total of 1 mm of taper. This taper ends at about 104 mm dia. which is a bit bigger than the diameter of a the paper record label. There is a 17 mm wide undercut after which the thickness comes back up to the level of the 8th step (2.75 - 1) the rest of the way in to the spindle hole. The idea behind the taper is to help press the record down onto the mat from the outer perimeter all the way to the last inner groove. I have found that a flat mat leaves voids where the record is slightly warped. Also, when using a flat mat with a record clamp, if the mat is simply lower at the centre than at the perimeter, it tends to jack up the record at the perimeter so it doesn't touch the mat at all. The taper was done in steps because it was easier to program for the machine shop than a continuous taper. I was trying to keep the price down. OK, I know everyone is thinking "What about the azimuth?". I did the calculation and my azimuth is out by 0.6 degrees. I am not sure I can adjust the cartridge any better than that anyway! By the way some tonearms don't even have an azimuth adjustment. If you own a unipivot arm you're never really sure if the arm needle is perpendicular to the groove. That being said, on my next DIY platter I may try dropping the taper from 1 mm to about 0.5 - 0.6 mm. The result works quite well. I can't tell for sure without cutting a cross section out of a record, which I may do some day, but it appears that the record is making good contact over all of the groove area. There is one problem that hopefully can be corrected in the next version; the act of machining the top surface of a disk of acrylic tends to make it bowl, thus the outer perimeter is slightly higher so it is about 1 mm off of the platter. The machinist that I worked with believes that it may be possible to correct this by cutting a shallow indent about 20 mm wide in the bottom of the disk. In other words, bow it back in the opposite sense. Why does acrylic work so well? Here is the thinking behind it. Music is retreived from the grooves on a vinyl record by converting the information in the grooves to vibrations in the stylus which are in turn converted into an electrical signal in the cartridge. Ideally, all of the vibrations flow up through the stylus into the cartridge and are converted into an electrical signal and nothing is lost. In the real world this is not what happens. Some of the vibration energy is transferred to the record and from there it can flow into the platter, the bearings, and the plinth, the base of the tonearm and eventually back into the stylus. The vibration energy can also be transferred from the stylus to the cartridge case, the headshell and the tonearm. It is very important to keep in mind that the cartridge transducer picks up vibrations and converts them into electricity no matter where the vibration comes from. Vibrating the tonearm or the record will be converted into sound just the same as vibrating the stylus. OK, so what. Well, One of the ways of mitigating these stray vibrations is to reduce the amount of vibrations initially induced into the record. Now, think about "audiophile" vinyl records. One thing they all have in common is thick vinyl. A standard record weighs in at 120 grams, audiophile recordings typically are from 150 to 200 plus gram. One of the benefits of heavier records, but certainly not the only reason for it, is that it is less susceptible to vibration. So what does all this have to do with acrylic mats? The acoustic properties of acrylic are similar to those of vinyl whereas the acoustic properties of other popular mat materials such as cork or felt or rubber are not. 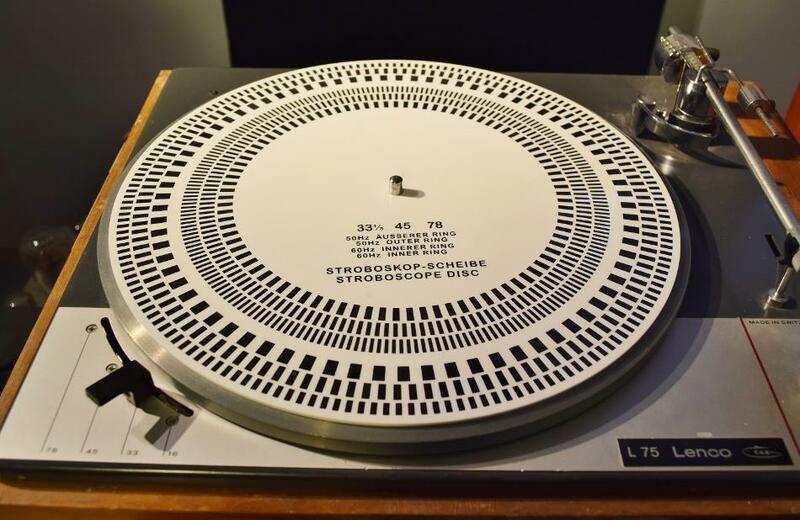 So an acrylic mat designed such that it makes solid contact with the record at all the right places is like making every record that you play twice as thick! The acrylic material was found to do the least damage to the sound than any of the other mats used and no coloring or tonal unbalance was detected. The profile used for this project is a first idea on what to do with a solid piece of acrylic. It can't be moulded like rubber however it could be machined with different types of grooves or ribs to replicate various rubber mat designs. Certainly this would have an impact on the bill from the machinist though! Please let us know if you come up with another design for an acrylic mat.